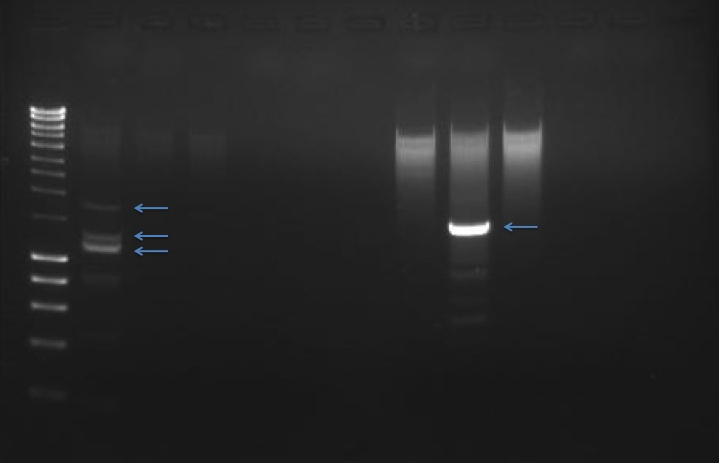 The bands that were excised and purified earlier today were cloned in to pCR2.1 using the TOPO TA Cloning Kit (Invitrogen) according to the manufacturer’s protocol with the following changes: used 4uL of all PCR products, incubated ligation reactions for 15mins @ RT, incubated competent cells with ligation reactions for 15mins on ice. Two volumes of each reaction were plated (50uL and 100uL) on Kan50 plates with X-gal (made 20010412 by SJW) and incubated @ 37C O/N. Ample number of white colonies for all 4 sets of cloning reactions. 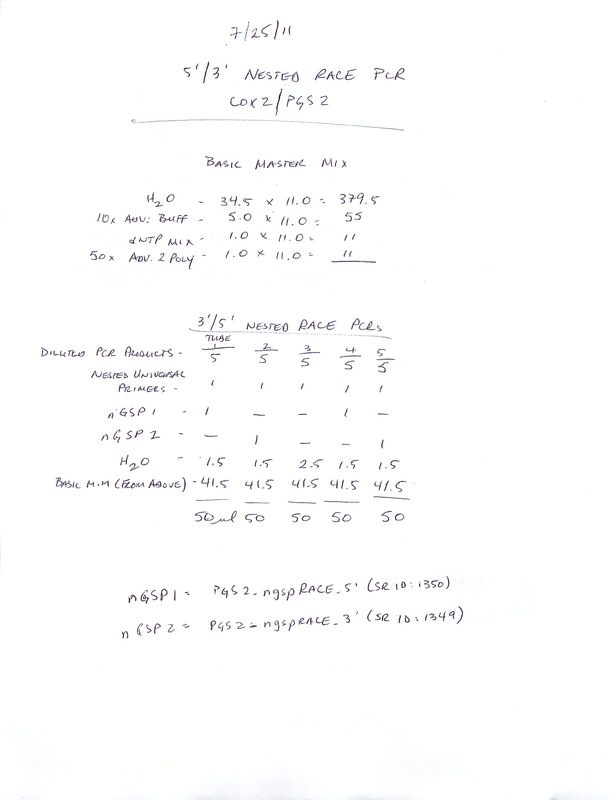 This entry was posted in Miscellaneous and tagged COX, COX2, Crassostrea gigas, cyclooxygenase, kanamycin, ligation, Pacific oyster, pCR2.1, PGS, PGS2, prostaglandin synthase, TOPO TA Cloning on 25 July, 2011 by kubu4. 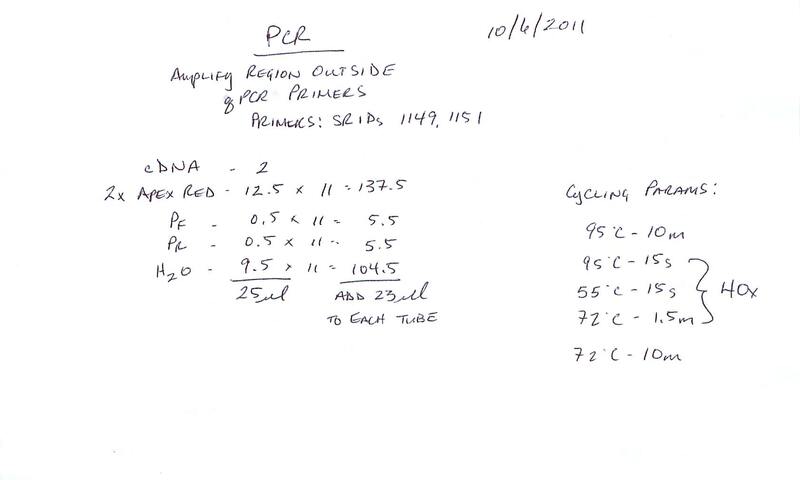 This entry was posted in Miscellaneous and tagged cDNA, COX, COX2, Crassostrea gigas, cyclooxygenase, gel, gel extraction, Pacific oyster, PGS, PGS2, prostaglandin synthase, RACE PCR, SMART RACE, Ultrafree-DA on 25 July, 2011 by kubu4. Reactions were run with both primers on both libraries, just to ensure that in case there was any confusion in primer design. 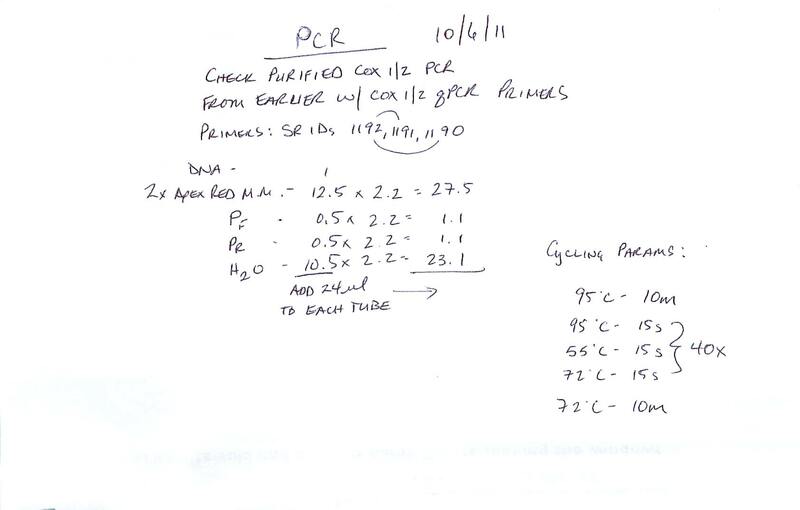 When finished, I will remove 2uL of the PCR reaction for use in a nested PCR reaction. 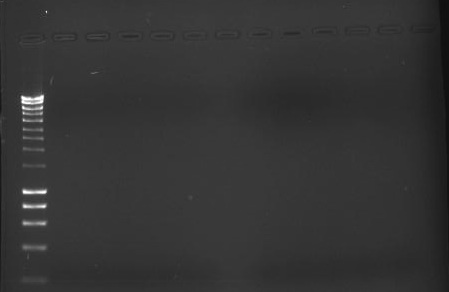 Will run a gel with both sets of products, once the nested PCR is completed. As has generally been the case, our primary RACE PCRs failed to produce any products. 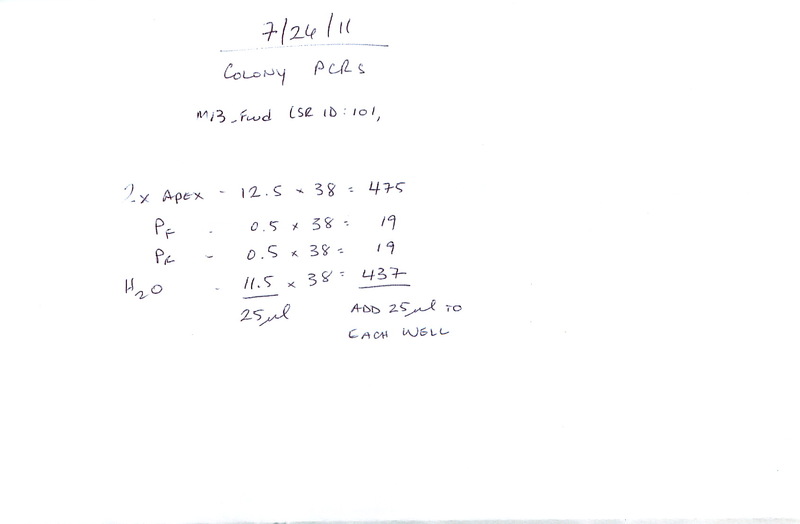 This is why I performed the nested PCR (described above) before viewing the results of this primary PCR. 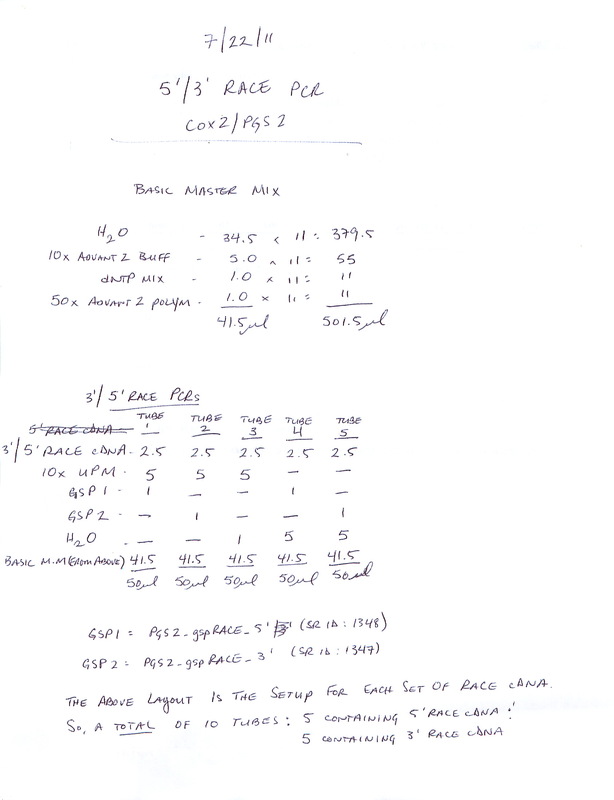 This entry was posted in Miscellaneous and tagged COX, COX2, Crassostrea gigas, cyclooxygenase, gel, Pacific oyster, PGS, PGS2, prostaglandin synthase, RACE PCR, SMART RACE on 22 July, 2011 by kubu4.